Bloomsbury Children's Books, 9781681198996, 224pp. Perfect for fans of Meg Cabot or Sarah Mlynowski, this second book in a fun series shows that kindness never goes out of style! Creative and fashion-forward Lucy Tanaka was thrilled when Chloe Silver moved to town. Together with Theo Barnes, they formed The Kindness Club, testing different acts of kindness on their friends, neighbors, and siblings. One day, Lucy learns that their classmate, Serena, recently lost her mother. On top of that, it's Serena's birthday next weekend. 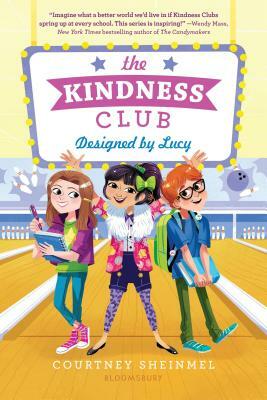 Lucy is determined to lift Serena's spirits, and she knows the perfect way to do it--rallying the Kindness Club to throw Serena the best birthday party ever at her family's bowling alley. Inspired by kindness projects and anti-bullying campaigns across the country, award-winning author Courtney Sheinmel's delightful series will have all readers thinking kind! Courtney Sheinmel is a recovering attorney, chocolate lover, mac and cheese expert, and the author of over a dozen highly celebrated novels for kids and young adults, including Edgewater, Sincerely, and the Stella Batts series. She mentors teen writers at Writopia Lab, a nonprofit in New York City, and she received a National Scholastic Outstanding Educator Award. Courtney wants to hear your kindness stories! Write to her at thekindnessclubbook@gmail.com.